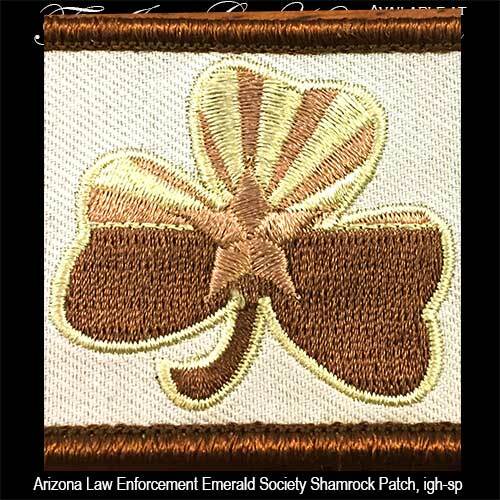 Irish patch features the shamrock along with an Arizona flag motif and it is the patch of the Arizona Law Enforcement Emerald Society. 100% of the proceeds from the sale of this Irish patch benefit the benevolent works of the Arizona Law Enforcement Emerald Society which includes assisting the families of fallen officers and first responders. Your generosity has raised over $700.00 has been raised since this promotion started in September, 2017. Through our special promotions and your assistance, The Irish Gift House has donated in excess of $37,000.00 to the Arizona Law Enforcement Emerald Society in the past decade. The Arizona Law Enforcement Emerald Society (ALEES) patch features an embroidered earth tone design of the Arizona flag inside of a shamrock. This Irish patch measures 3" wide x 1 3/4" tall and it is two piece military or tactical style design with a Velcro backing. This shamrock patch will look great on caps or clothing along with backpacks and you will be assisting ALEES help the families of fallen first responders. The Irish Gift House forwards 100% of the proceeds from each patch sale to ALEES. Read more about this endeavor on our BlogSpot, http://www.theirishgifthouse.biz/2017/10/arizona-law-enforcement-emerald-society.html. Irish pubs of Arizona t-shirt benefits the benevolent work of the Arizona Law Enforcement Emerald Society. Irish Pubs of Arizona long sleeve t-shirt benefits the benevolent work of the Arizona Law Enforcement Emerald Society. Irish Pubs of Arizona V neck t-shirt benefits the benevolent work of the Arizona Law Enforcement Emerald Society. 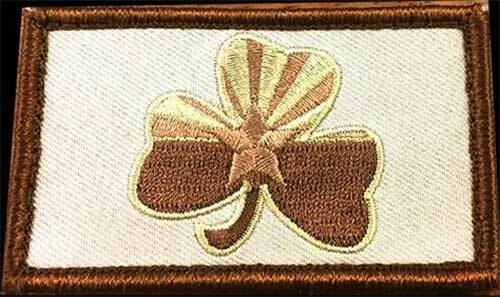 Irish patch features the shamrock, the most recognized emblem of Ireland.